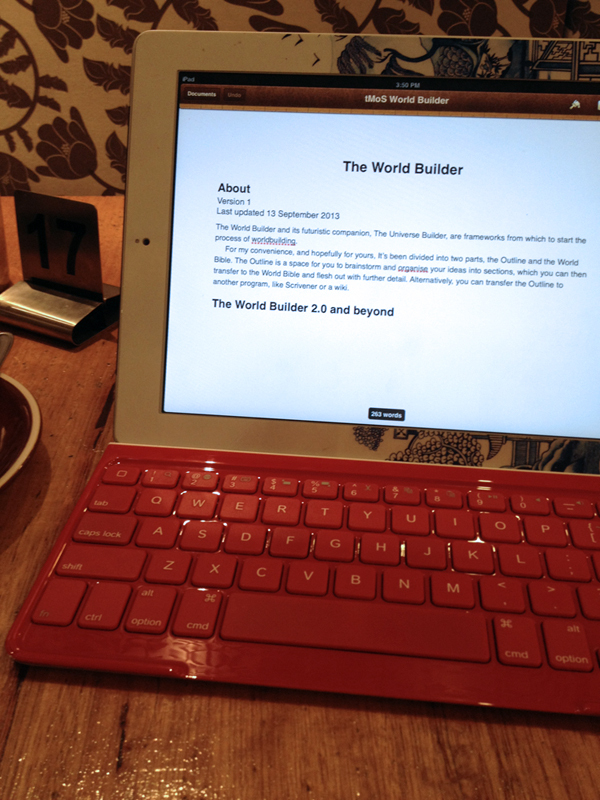 Just whip out the iPad and get world-building, while you wait for you morning hot chocolate. Patricia C. Wrede’s Fantasy World-building questions are great, and the World-building Leviathan is equally awesome, but there are times when they just don’t hit the spot. Like, when you’re halfway (or more) into your novel and you need to sort out what a battle mage can do that an illusionist can’t. Sure, you can jot down a few notes and whack them into a notebook, but if, like me, you can’t stand the thought of not being organised, something a little more structured is in order. Normally, I’d turn to Scrivener, but, until the iPad version comes out, it doesn’t work so well on-the-go. Yes, you can sync your files to an external folder and edit them on the iPad (which works great for writing), but whatever file structure you’ve created in Scrivener is lost, and when I’m world-building I need folders, and not just any folders, but nested folders and lots of them. And so, I set out to make myself a template in which I could make random notes, while still being organised, and that I could use just as easily from my laptop as my iPad. Staring at a blank screen and wondering how the hell you’re going to tackle all of the information that goes into worldbuilding can be hard. The World Builder and its futuristic companion, The Universe Builder, are frameworks from which to start the process of worldbuilding. As word documents, the builders are pretty simple, and nothing you couldn’t whip up on your own. There are some styles in there, a table of contents that automatically updates (at least in Pages, I’m not sure about Word) and an outline to start you off. The documents have been divided into two parts, the Outline and the World Bible. The Outline is a space for you to brainstorm and organise your ideas into sections, which you can then transfer to the World Bible and flesh out with further detail. Alternatively, you can transfer the Outline to another program, like Scrivener or a wiki. Although they work great on a computer, being able to go anywhere and work on your world (without having to lug around a laptop) is their real beauty. All you need is a tablet device, with a rich text editor, and cloud-based storage. If you have a Mac, you probably have Pages (it comes pre-installed), and if you have an iPad, you can download the Pages app and comfortably sync your world-building using iCloud. If you don’t have one, or any of those, or think that the Pages app is ridiculously priced (at AUD10.50, I don’t blame you), there are many other options, such as Dropbox and Textilus or Google Drive and goWriter. If you’re not an Apple user at all (the thought boggles my mind) it would be great if you could make a few app suggestions in the comments below. If you like the world-builders, or just the idea, let me know what you think, how you use them, if you use them and what could be done to make them better. If there are other, similar or better templates out there, I’d love to hear about those too! I also anxiously await the day when the Scrivener iPad app is a reality. In the meantime, I think a wiki would also be good for this. Something that can be easily accessed via a web browser from anywhere whether on my computer or iPad. I actually started one using the free https://www.zoho.com/wiki/ service for a collaborative story that I was writing with 2 others so that we were all on the same page. There are also a couple of personal wiki iPad apps that may be useful, but I haven’t tried them. Thanks for the templates! I’m beta testing one of the final few betas at the moment (July 2016). It should be available sooner than later. It syncs perfectly with the desktop app and Dropbox. I don’t think it is too big a risk to predict with some confidence that Keith will release it by the end of July or early in August 2016. Certainly worth waiting for. It really, really works beautifully. I’m excited by it and justifiably so. Thanks for the goodies. I enjoy the great posts on Scrivener templates and the little things like these docs for on the go planning. I have been working my way through a good digital workflow myself, having acquired an iCrack mini and smearing its screen with my grubby little hands. So far, Mac Scrivener -> Sync as text files (for editing in Byword, the only iPad app that syncs Dropbox files for OFFLINE use) or Sync for iOS Index Card app (if I am in the planning stage, though you can edit actual text, not just index card info). 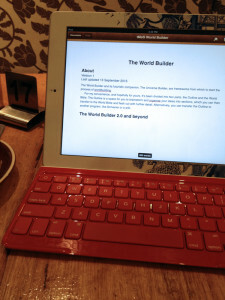 So Scrivener -> Dropbox sync -> Byword or Index Card + Sharkk bluetooth keyboard = not to shabby mobile writing. Anyway, that’s my 2 cents. Thanks for the files, and all the nice links to templates. For iOS, there is a notebook app called circus ponies notebook 4. It allows you to have sub folders and everything. The only problem for me is that I can’t draw in it, although you can ,import pdf ‘s and pictures to it. It’s the closest to an all in one app i have found. Unfortunately there is nothing like it on android.